The Pop-Up Portable Display concept has been widely used across the industry for decades now. From that model our TexFrame Fabric Display was introduced (launched in 2012). Both are still popular options in serving the purpose of user's applications. 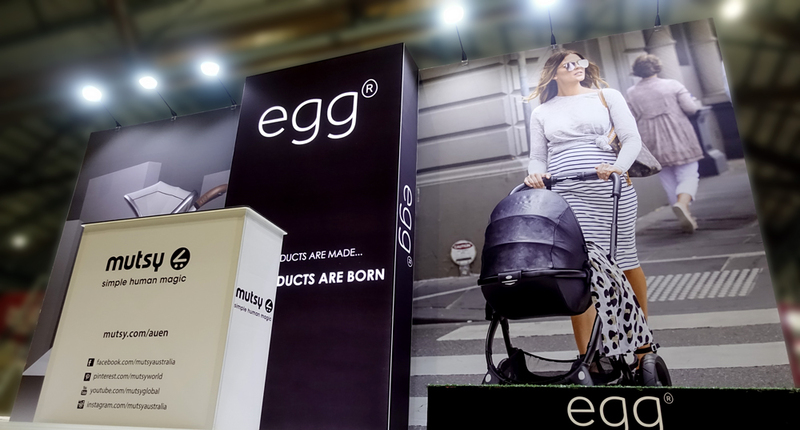 Now, a new breed of display solution has been born when TexFrame married Pop-Up Displays. 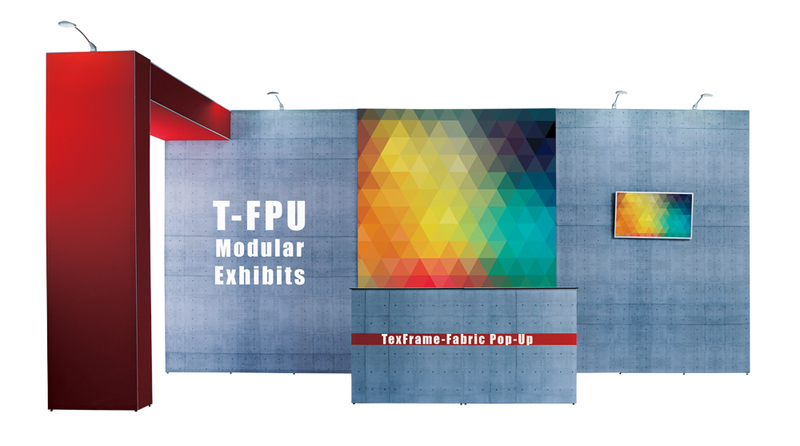 We name it as T-FPU (TexFrame Fabric Pop Up). The T-FPU inherited the best genes from its parents. 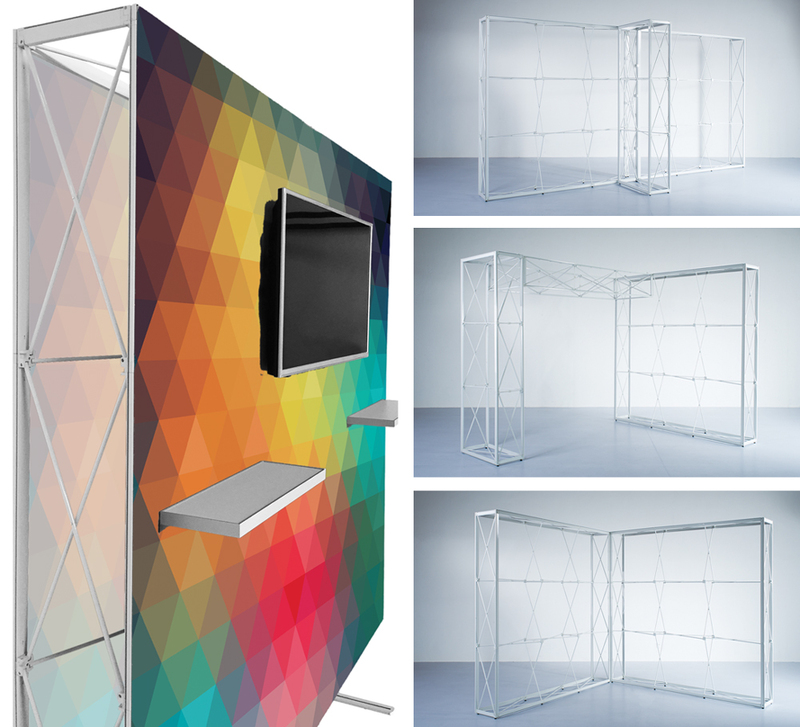 It transforms the way to build your exhibition booth. • Lack of uniqueness: many users are showing the same old display time after time, with minimal impact and an outdated physical presence. • Spent too much time on setup at bump-in and dismantle at bump-out. • Too difficult to transport and store. Too expensive in transportation for interstate or international show. 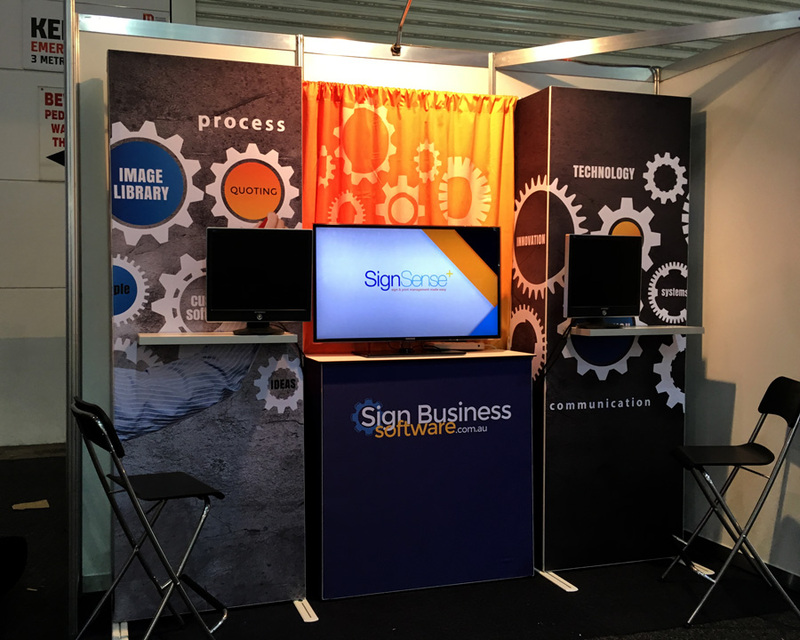 • Budget constraints preventing clients from having out standing displays to catch attention. • It can build large & small stands for an unique and practical display design. • It is extremely light and easy to assemble. • No Tool is required for setup and dismantle. • It is compact for easy mobility & storage. • It can be reconfigured for future use. • Having your stand look larger than your budget. • The modular approach: T-FPU inherited Pop-Up's sectional design with numbers of row & column for a variety width & height configurations. You now have the selection of the smallest 1x1 to the largest 4x4 configurations, and the combination of any of them. Your stand will never look same! • TexFrame Silicon Edged Fabric Graphic is adopted for T-FPU graphic skin. Seamless graphic for great visual impact and easy to transport and store. • A range of sought after accessories are designed. It is possible to build a giant back wall, overhead bridge or freestanding tower, and many more exciting options. • Special Shelfing Kits, Monitor Bracket Kit and Stabilizing Feet are available. • The Backlit Convert options are ready to light up the entire, or part of graphic skin. Making your graphic stand out from the rest. T-FPU Modular Exhibits makes your brand stand out of the crowd and gives you the highest value of return on investment. "This system has two advantages over our previous one: firstly we had a big structure and transporting it from state to state ... it was a big issue (and storing it)! Whereas this one it's very small ... that's the first advantage. The second advantage, the other system we had to pay a few thousand dollars for people to erect it & dismantle. Whereas this one, we can do it ourselves. Also as I'm always growing with different brands & adding more products ... if you want to change the signage you only change the skin. It's the flexibility: you can add or you can minus or make it bigger or smaller anytime." Click here for the video of the interview. T-FPU Modular Exhibits also work well for small 3m x 1m booth with two 1x3 on each ends and a T-FPU Counter in the middle. It is a small booth with big features just right for the applications. "Dealing with the guys at ADI are an absolute pleasure, right from offering the best system to suit our needs and budget to helpful ideas and concepts how the achieve what we needed - all on time and exceeding our expectations - looks AMAZING - great job to all the team at ADI!"